Crazy cool bartender is what you are! Yes, the ultimate game on becoming the master bartender is here and its so crazy, there's a mania for cocktail bartender! Cocktail Bartender is all about giving the best service by becoming the master mixer of wine and other spirits, there's no day off in this when you have the coolest bartender job of all time, you work on xmas and other holidays to keep the crazy party going. Cocktail Bartender is played very simply. Every time a customer comes in with his glass of spirit, replace it by sliding the glass on the table by tappy the glass button on the left. Use the up and down button to move from one bartender table to another. This cocktail mania edition drives everyone crazy! So have a glass of wine and have fun becoming the master bartender now! - Party mode ambiance to feel what the game is all about! - Cool, crazy graphics to keep you playing! - Great bar music to get you into the master bartender mode. - Swift and smooth game interface for easy record-breaking score. - Free for a life time! 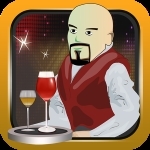 - Create a friendly bartender competition with your mates by sharing this game through its online sharing interface!